The report from the IPPC released on Monday on climate change claims climate change has already started having an impact across the globe on people’s health and access to good water/food resources. The summary of the report firstly outlines what previous adaptations across the world have been like, and what affect climate change has had in the past. It then moves on to the more pressing topic of how climate change is going to affect our resources now and in the future, and what, if any, adaptations can be made in order to decrease the effect this has upon daily life and access to resources. But the main punch of the report comes from the affect that climate change is going to have on food security and production. 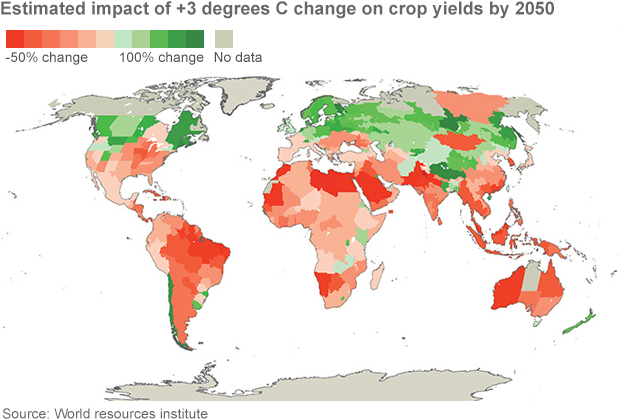 Crop yields are going to be hit badly up to 2050, and even worse after that time, if nothing changes. But there is a key point that this article hits home, that it is going to affect us more than we thought, and that is going to be the case whether we make changes or not, but if we make changes we can change the effects of climate change in the long term future, slowly curbing the effects.